I am a journalist and a native North Carolinian — the great-granddaughter of tobacco farmers — who firmly stands against the launch of another Big Tobacco-like industry in this country and firmly stands for drug policies rooted in evidence-based science. I am opposed to marijuana legalization because I have researched the subject for years. I have access to information about the drug and see things related to marijuana use that many people do not because I’m married to Dr. Christian Thurstone, whose website you’re reading. He’s a world-recognized physician who specializes in the treatment and research of marijuana addiction, especially in adolescents. Because of his work, I have had a front-row seat to just some of the horrors far too many American families have experienced because of marijuana use — problems that are vastly underreported by news organizations and have increased as the United States has expanded access to marijuana under the slimy guise of “medicine” and narratives that are easily debunked with a good look at public records. I do not feel compelled or obligated to give non credible sources equal time and voice alongside undisputed, fully transparent experts (that certainly doesn’t mean I haven’t reviewed my fair share of non credible sources where marijuana is concerned). The longstanding — and, if journalists are honest, often wacky — “balancing” act that can compromise the accuracy of news coverage is one members of the national journalism ethics committee of the Society of Professional Journalists have warned about for decades. 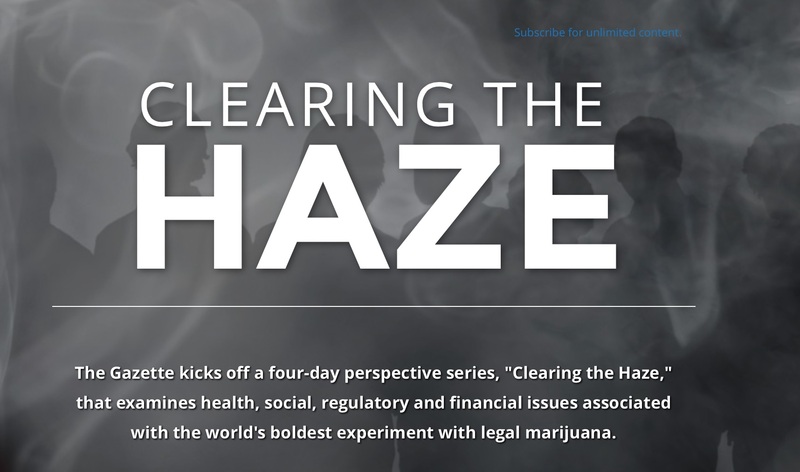 It is a current problem with much of today’s news coverage about marijuana and its legalization — news coverage that is also far more driven by anecdotes than by the findings of a world body of medical literature. So, when The Gazette’s editorial board, which has made its own opposition to marijuana legalization well known, asked for my assistance with a series of perspective pieces that would highlight sorely underreported aspects of Colorado’s legalization of marijuana, I happily obliged. When the editorial board requested to speak with my husband and another highly regarded addiction-treatment specialist at the University of Colorado Anschutz Medical Campus, they happily obliged. The editorial board included their perspectives in the series. Today, Gazette Editorial Page Editor Wayne Laugesen spoke with Fox & Friends about the series — which I hope you’ll visit online at www.gazette.com/clearningthehaze. As Mr. Laugesen noted, the Washington Examiner is running a slightly edited version of the series in a magazine-style format. You also can order reprints online. My work to analyze and report on this issue will continue. So well said, Christine, another of my heroines!